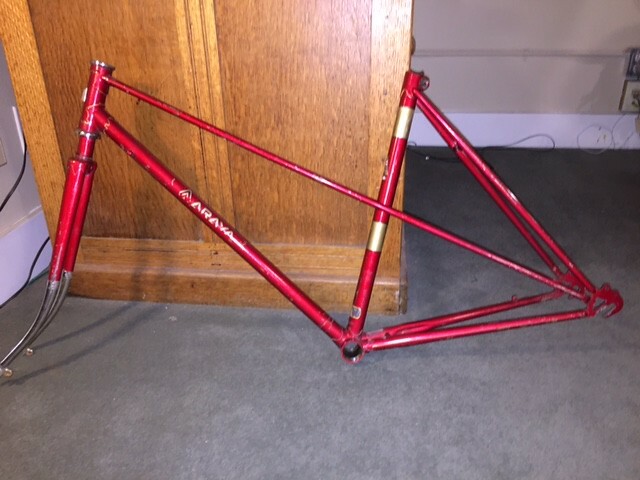 A fellow forumite gifted me this beater Araya mixte frame, which I intend to repaint and build up for my wife. Since there seems to be very few of these out there, here are some photos to get all the labeling on the internets before I prep it for paint. What do you guys think, late 70s? Early 80s? Last edited by Lascauxcaveman; 08-14-17 at 10:22 AM. Almost forgot the tubing decal, sort of a silver foil dealie. It says "BUILT WITH ARAYA STEEL TUBINGS." I don't know if they pluralized it to point out it has more than one kind of Araya tubing or whether it's just a typical 1970s Japenglish mistranslation. Definitely not 531. Frame/Fork/headset weighs 8.3 lbs, so it's probably cro-mo something along the lines straight gauge 4130, is my guess. Not super heavy thick gas pipe anyway. It takes a 26.0mm seatpost. Last edited by Lascauxcaveman; 08-14-17 at 10:25 AM. Reason: speeling, I'm always misspeeling teh werds. had a gents one come through about 1980 that looked to date from ~1972. it was light blue metallic and had the same head emblem as the machine under discussion. have never known a thing about the badge/manufacturer. will be interesting to follow the thread. thanks for posting frankish cave painter. that is an unusual serial placement. cannot recall seeing anyone place it there previously. Mine has the same headbadge. I think they used if for several years. That's a nice looking paintjob though, I like color. Mine has a serial number on the bottom but I could never find anywhere to look it up. Last edited by Lascauxcaveman; 08-14-17 at 10:35 AM. thank you for the response. alas, cannot recall much about the one that came through my place. remember it as having a low end cotterless chainset such as sr silver or sugino maxy and some modest gear system such as maeda honor. it may well have had this same serial placement. upon reflection, i think it passed through me place in 1979.
your example is certainly well traveled vectoring from honshu to north america, being retailed in my knee oh polis!, thence going walkabout all the way to the great northwest. btw - the latest images you have posted are not displaying for me. the original images display fine but the newest ones are just question mark icons. or maybe they are emoticons rather than photos? Those last three ?s in post three, you mean? Those went up for some reason when I went back to make an edit. There are only two pix on post number three. The two with the "tubings" sticker. Maybe if you close your browser then reopen the page again the ?s will go away. They seem to come and go randomly, for me. I see it a lot here. thank you. so done, et voila elle est disparu! Thanks for posting the pictures and serial number. "9" = Year of manufacture of the frame. 1979. Here is another Araya Competition mixte, with a serial number 18 less than yours. Thanks for explaining the serial number format; where'd you find that info? 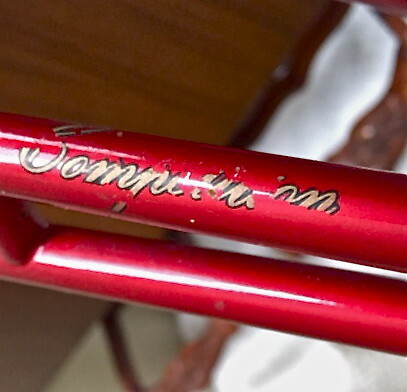 Was I correct in guessing this frame is from the Kawamura factory? And I did previously see that link to the other Araya mixte you included, that's where I got the idea to turn the bike upside down to read the "Competition" label. My theory is the guy in the paint shop putting the decals on the finished frames that day didn't read English, and took a 50/50 shot on how to orient them on the top tubes! The serial number decoding I determined from looking at many other Araya serial numbers. 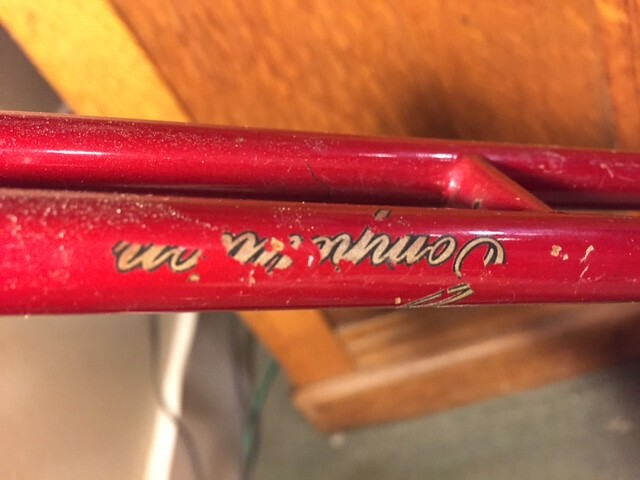 Kuwahara? 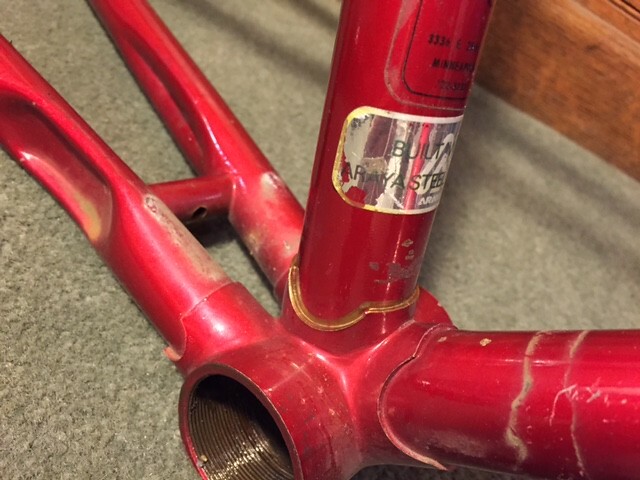 I think that it is unlikely that Kuwahara was the frame builder. Why? 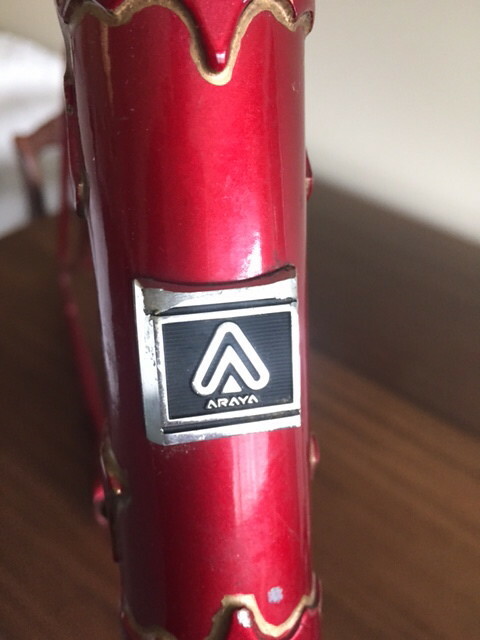 Several other brand names from the 1970s and 80s have frames with Araya serial numbers, including Nishiki, SR, and Vista. 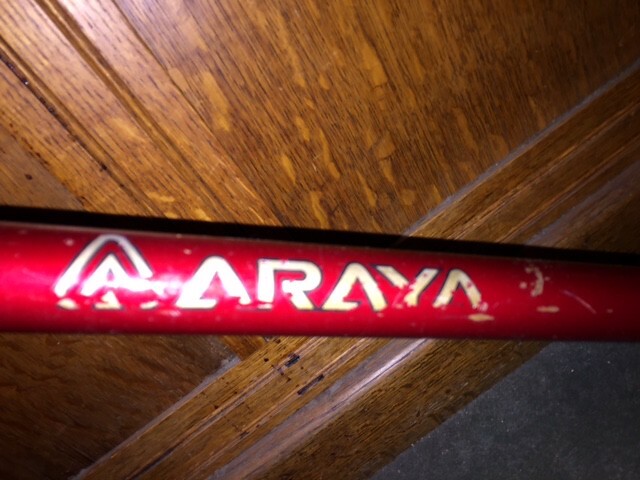 So I think frame building was one line of business for Araya. 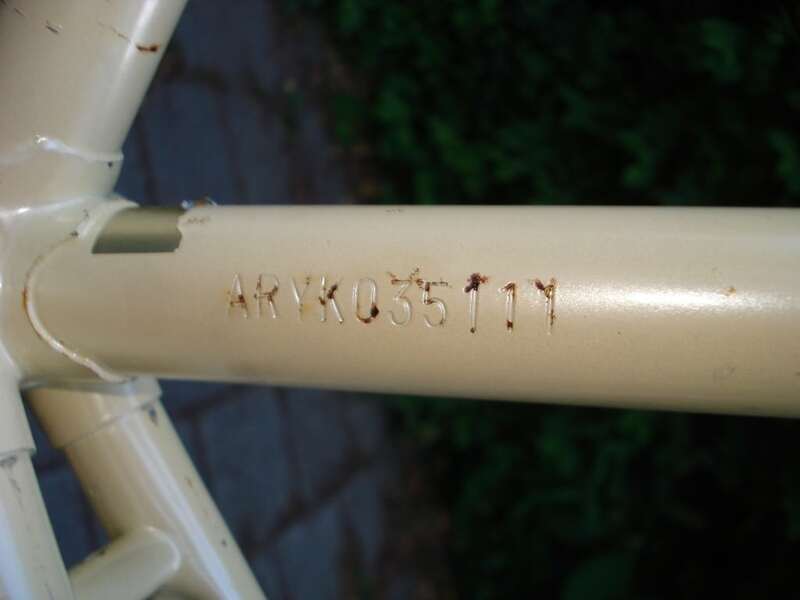 Kuwahara built frames for many brand names and the serial numbers have the standard Kuwahara format. thanks for all of this great information Hummer. very helpful! have seen a few Vista bicycles and always wondered if it might be a house brand for a distributor or chain store; do you perhaps know? I think Vista was a manufacturer in its own right. There's at least one thread on them on this forum, right here. Thanks very much Father Christmas! Our non-fixie seems to have at least one of everything. Here's the serial on my Araya. Anybody know of somewhere I can look this up? Thanks for posting the serial number. 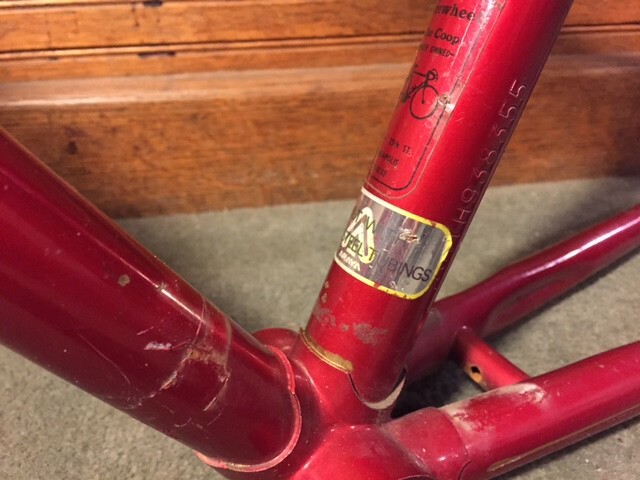 Do you have any pictures of the full bicycle, headbadge, original components and/or decals? It makes things easier when trying to date a bicycle. Based on just the serial number, this is probably "D"= April, and "4" = year 1974. The earliest Araya serial numbers that I have identified did not have the "ARY" prefix. In 1976, and maybe 1975 or late 1974, the "ARY" prefix began to appear. Also the first serial numbers were on the BB shell. Later the serial numbers were on the side of the seat tube, and later still they moved back to the BB shell.